At The Wedding Woods at Circle S Farms, we feature the magic and enchantment of the outdoors in a stunning venue perfect for weddings and events. Nestled on a 200-acre farm, our venue is a truly unique location surrounded with moss covered rocks and riveting views. With a serene opening in the forest, we have benches and a natural stone walkway ideal for that special day. We also offer a marvelous outdoor pavilion and a large reception hall with sliding doors for open-air or enclosed gatherings great for hosting receptions and more. With a stunning display of nature paired with every convenience you need, you'll be left in awe with the possibilities at our beautiful venue. "LOVE MUST BE AS MUCH A LIGHT, AS IT IS A FLAME"
Host your dream wedding and reception on the grounds of Circle S Farms. Bring your wedding planner, caterer and photographer, or let us help you create your perfect day. The Wedding Woods at Circle S Farms: conveniently located near Interstate 40, SR 840, and Highway 109 between Lebanon and Mt. Juliet, TN. Contact us for more information on our amenities, rates, and location. While you will experience the breathtaking, untouched beauty of nature here at The Wedding Woods at Circle S Farms, you will also be provided with all the necessary conveniences you'll need including a bridal and groom's suite, a kitchen, and a brand new reception hall. We can easily accommodate up to 300 guests, and we offer tables and chairs along with the option for in-house catering. Whatever you need to make your special day a success, we're here to deliver! 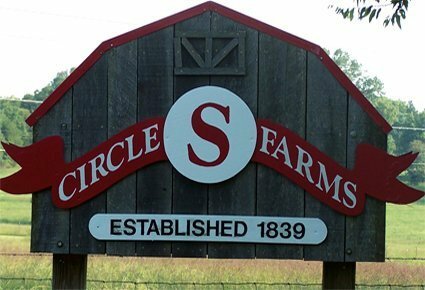 Established in 1839, Circle S Farms is a stunning location nestled on over 200 acres. Here, you'll not only find our enchanting venue within the forest grounds but also a family-friendly environment that offers catering and farm fresh raised pork. Additionally, you can pick your own berries, shop for homemade jams and jellies and so much more. Click the link below to visit their website.